We are happy to announce that Proud Mode Quests up to Quest 625 will be available as of Aug. 2, 2018 12:00 a.m. (PT) / 7:00 (UTC)! ・Proud Mode is a mode that allows you to re-challenge the Main Story quests at a higher difficulty with special rules. ・By clearing Proud Mode quests you can obtain new Keyblades as well as rare rewards such as Power Gems, Speed Gems, and Magic Gems, along with Dark Matter and Electrum Ore to level up the new Keyblades, Magic Mirror Medals to raise your Special Attack Bonus by 1%, and more! ・You can challenge Proud Mode by tapping on the Proud button from the Story Quests page! 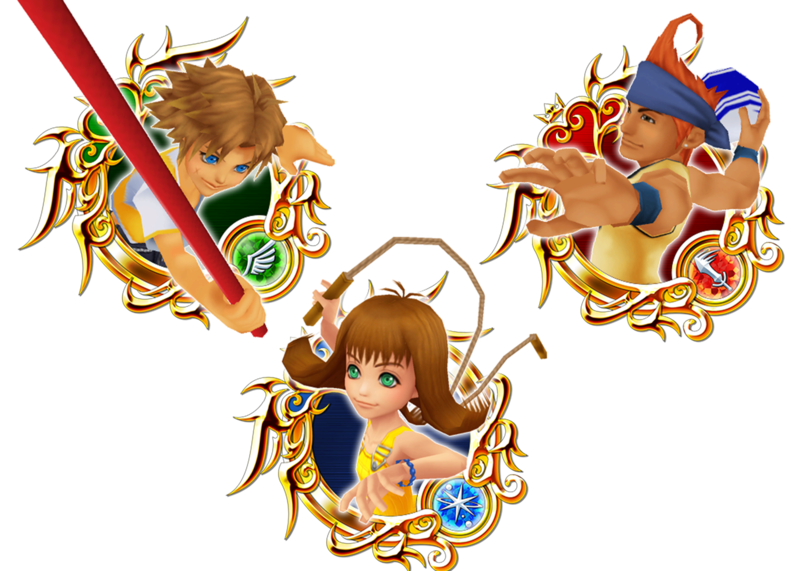 ・The Keyblades you can use are fixed for each quest. ・There are limits for each quest regarding which Medal's abilities you can use. Only special attacks with a bonus value of 40% or higher allowed. ・You cannot continue in battle. ・You cannot use Friend Medals. KINGDOM HEARTS 358/2 Days Free Jewels Campaign! ★Celebrate our KINGDOM HEARTS 358/2 Days collaboration event with free Jewels!! The Jewel prizes will be higher depending on the number of people that participate in this event, so work together to try and get the maximum Jewel rewards! Good luck! For each 10,000 people that clear the event, 1000 Jewels will be given out. The maximum amount of Jewels you can receive is 3000. Clearing the event is only counted once per player. Please note the Japanese version and Global version will be counted separately. Introducing the Subslot Strengthening Event! Take advantage of this chance to collect lots of 6★ Tier 1 Medals to evolve and fill up your subslots! ・Collect 6★ Tier 1 Medals to evolve into 7★ and fill up your subslots. ・A total of 4 quests will be available during the event period. ・Receive the following 6★ Medals by completing challenges and through enemy drops! ・The above-mentioned Medals will drop at an increased rate from enemies. ・Medal drop rate increases based upon the quest difficulty. ・Also be sure to keep an eye out for the Item Egg, which when defeated, guarantees a Medal drop! Get 7★ Tier 4 or higher Medals! Get 7★ Tier 4 or higher Medals!! ・Draw three times per day during the above campaign period to receive 7★ Tier 4 Medals or higher!! ・1500 Jewels gets you 5 Medals, all of which will be 7★ Medals! ・Even better, one of the Medals is guaranteed to be a 7★ Tier 4 or Tier 5 Medal! Don't miss out on this perfect opportunity to expand your Medal collection! NOTE: You can pull up to three times per day from this deal. Updated with today's two events and one banner deal.